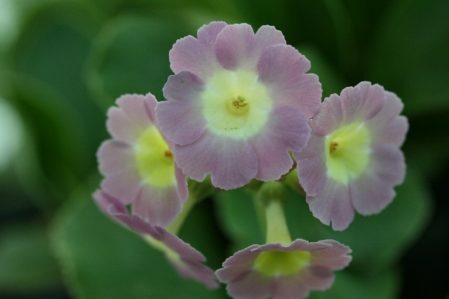 PRIMULA auricula Powder Puff - Woottens Plant Nursery Suffolk. Border. Unusual form. Iridescent blushed pink with clear eye. Tall scapes. Flowers March-May. Lightly fragrant. Robust plants that can be used in the garden. Ht. 15cm. Sp. 15cm Well drained soil. Shade in the summer, shelter from wet in the winter. Hardy.